When there is a space restraint and ductwork is not an option, boilers work great! Boilers heat water and use either the water itself or steam for heating. With boilers, hot water can be distributed via radiators, baseboards, radiant floor systems, or coils. 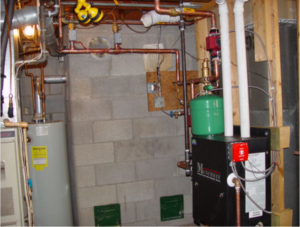 Boiler heating has become very efficient over the years, becoming a leading choice for the Milwaukee-area homeowners. During Wisconsin’s cold winters, warm radiant floors are a great option for your home. Boilers are not just for homes that have space restraints. Many people use them solely for the comfort of warm floors. If you are interested in a new high-efficiency boiler, or need boiler maintenance / repair – Quality Heating are your boiler experts. The efficiency of boiler heating systems have seen great improvements over the years. Older boiler systems have efficiencies in the ranging from 56-70%. They tend to waste gas, wood, and electricity by using needless amounts of fuel to operate, which ultimately costs more money. Quality Heating has great news for your wallet. We design and install high-efficiency boiler systems to replace your old, worn out, inefficient, or over-sized model. The modern water boilers we provide achieve efficiency as high as 97%. If the boiler in your home is over 18 years old, it’s a drain on your wallet and the environment. A higher efficiency water boiler means more of your energy dollars are used to heat the home and fewer dollars are wasted. At Quality Heating, we know that it’s not always necessary to replace your water boiler. We provide the best quality boiler services or repair, offering preventative maintenance to all customers in Southeast Wisconsin. Our services will lengthen the life of your water boiler and prevent costly breakdowns. When it comes to water boiler maintenance, there are two strategies homeowners can employ: proactive and reactive. Proactive means you are having annual maintenance completed by a licensed contractor. Reactive means you don’t think about your boiler until something goes catastrophically wrong (such as waking up with no heat). Proactive is the better choice between the two, The following tips in this section can help ensure your boiler has a long and productive life. Check the pilot light. Before cold weather arrives, you should be in the habit of making sure that your boiler’s pilot light is still ignited. We recommend checking every two months. Check the water pressure. Make sure your boiler’s water pressure is at the correct pressure level. If you’re unsure of optimal levels, check your owner’s manual or the boiler manufacturer’s website (there is a gauge located on the boiler). Check the inlet valves. If your radiator starts to leak, inlet valves may be the culprit. These valves let water into your boiler, where it’s then heated and sent to radiators or baseboard heaters. Inlet valves tend to loosen with age and fixing them is often as simple as tightening the nuts on either side of the valve. If this doesn’t work you may need to flush the boiler system or replace the valves. Bleed and clear the radiator. If your boiler uses radiators, you’ll need to clear them every year or two. If your radiators don’t supply heat like they used to it could be because the system is air locked which is trapping water. You can also bleed the radiator by opening the bleeder valve with a screwdriver or a special key (some radiators require these). Allow the water to run into a cup or bucket. Contact Quality Heating for professional help. Remember, regular maintenance and inspection can increase the operational lifespan and usability of your water boiler exponentially. While some issues are easily fixed by the average homeowner, letting a trained water boiler repair technician service and inspect your boiler is always a great idea. The technicians at Quality Heating know how to fix any issue and can repair or replace your boiler when needed. If you need boiler services or replacement, call the professionals at Quality Heating. We can discuss your problems over the phone, provide a free quote, and set up an inspection. Since 1961, we’ve been proud to serve southeast Wisconsin and have earned the reputation of being a leader in our field. Contact us today by using the online contact form or by calling us at (262) 786-4450. Our emergency services are available 24-7.